BIG IS BEST. That’s the guiding principle behind these mammoth landmarks. But it’s not just the sheer size that attracts tourists in droves to these famous structures; they all have something pretty special you can’t find elsewhere in the world. For those who appreciate engineering feats on a grand scale, this bucket list is for you. At 555 metres high, the views over Dubai and the Arabian Sea from the outdoor observatory at Burj Khalifa will take your breath away. For a more exclusive experience, reserve a table at the sky-high restaurant or stay in one of the designer suites by Georgio Armani himself. Just make sure you have a head for heights before zooming to the top in the lightening-fast lift, it’s one of the fastest in the world. Towers Rotana Dubai: Centrally located on Dubai’s Sheikh Zayed Road, Towers Rotana is an ideal base for exploring the city state. This luxury hotel has two major draws: a rooftop swimming pool with urban views and an award-winning restaurant. Keep the world record experience rolling by patronising the on-site bar, it’s the longest in the Middle East! Jumeirah Emirates Towers: Round out your Dubai itinerary with free entry to Wild Wadi Waterpark and the Private Beach at Zero Gravity when you stay at Jumeirah Emirates Towers. This hotel does luxe on a grand scale; beyond sprawling suites with heady views of Dubai, it also contains an in-house boulevard shopping mall, nightlife options and a restaurant complex. Fittingly known as “The Big House,” Michigan Stadium holds a whopping 107,601 American football fans. When it’s not football season the stadium hosts lacrosse games. For a tour you’ll need to visit between seasons, when it’s open to visitors on weekdays. Stone Chalet Bed and Breakfast: As a lover of all things grand, it makes sense for you to stay at the largest bed and breakfast in Ann Arbor. The Stone Chalet is a seven-minute drive to Michigan Stadium, with a delicious complimentary breakfast supplied to fuel guests before their tour around The Big House. It takes a 30 minutes for a full spin in Las Vegas’ High Roller. Luckily there’s 28 cabins holding 40 people each, so everyone gets a go. Just make sure to mark out a spot for yourself on the right side of the cabin, as this is where you’ll get the best views of The Strip. There’s also the option of booking out a whole cabin for a hen or stag night to remember, complete with your own bartender. The LINQ Hotel & Casino: Staying at the home of the High Roller gives you unrivalled access to the big wheel. The rooms are modern and decorated with quirky pops of colour. Feeling dizzy after your ride? Recover by the pool with a deluxe cabana suite, complete with drinks service from the bar. The Venetian & The Palazzo: Boasting some of the largest guest rooms in the world, as certified by the Guinness Book of World Records, The Venetian is the epitome of luxury. Due to its stellar location in the heart of Las Vegas’ Strip, several of the swanky suites offer stunning views of the High Roller. The Cromwell: Feeling overwhelmed by the sheer magnitude of Vegas? As the first boutique hotel on The Strip, complete with hardwood floors, sophisticated furnishings and soft lighting, The Cromwell offers a certain ‘je ne sais quoi’ amidst the usual casino glare. The elegance continues with a Moët & Chandon Champagne reception hosted by the hotel’s general manager on Friday and Saturday nights. You’d be forgiven for expecting the world’s largest casino to be housed on the notorious Strip in Las Vegas. However, it’s the Cotai Strip in Macau that gets full bragging rights for a casino which is not only the largest in the world, but also ranks seventh in the list of largest buildings. 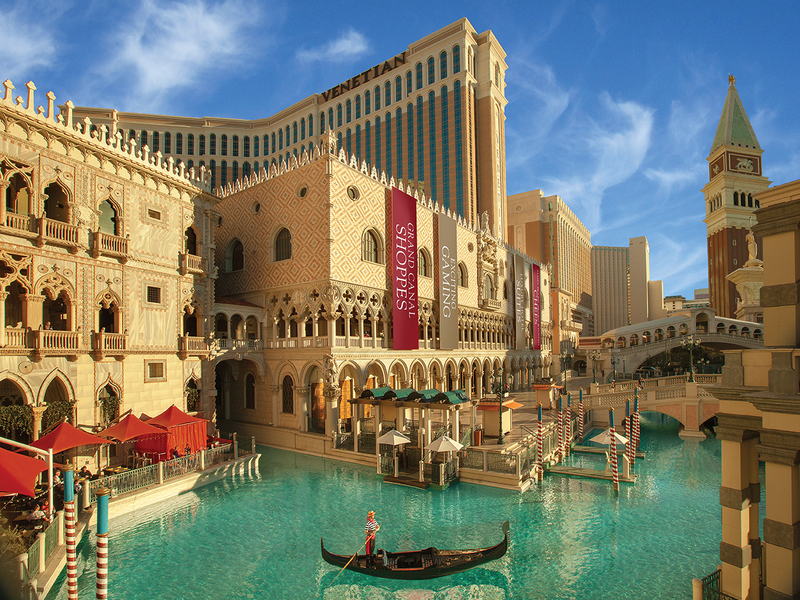 So massive are the grounds that, besides the casino, hotel and four swimming pools, you can also enjoy a gondola ride through a life-size replica of the canals of Venice. Venetian Macao Casino: Not just the glamourous home of the world’s largest casino, the suites at the Venetian are synonymous with luxury. With some of the opulent suites clocking in at up to 355 square metres, to say that they’re ‘big’ is an understatement. Entertain guests in the meticulously decorated living areas and soak any cares away in the generous bathtubs. You’ll never want to leave and, the good news is, you don’t have to! Galaxy Macau: Taking up over 1.1 million square metres of real estate, the Galaxy Macau is more than a mere hotel. Despite being neighbours with the Venetian, the sheer size of both complexes means you’re in for a two kilometre stroll door-to-door. Luxury is the order of the day in the opulent suites housed within the complex’s white and gold towers. 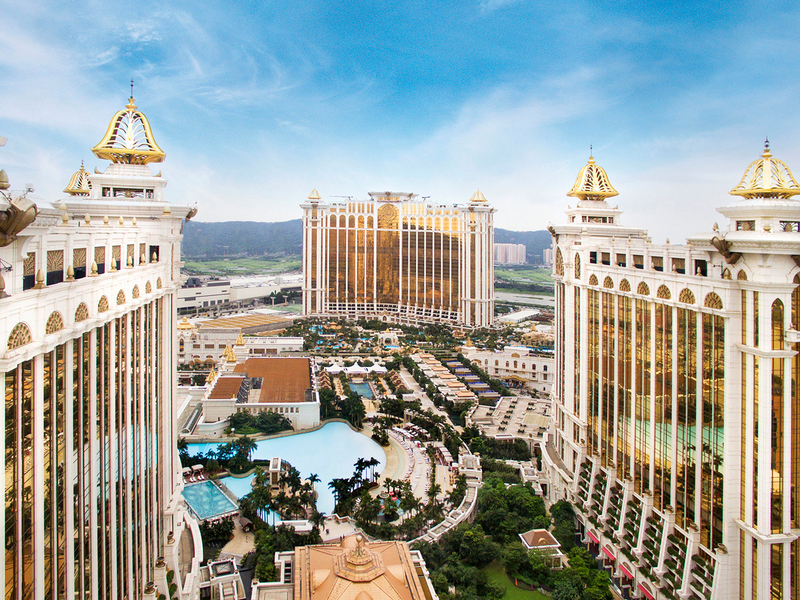 Sheraton Grand Macao Hotel: The 4,001 rooms and suites of this 5-star hotel are located at the heart of the bustling Cotai Strip, only steps away from premier shopping, dining, and entertainment. But you’ll find it hard to venture even that far afield with three glamourous outdoor pools, complete with palms and al fresco dining options, a luxurious spa and plenty of entertainment options for the kids giving you every reason to stay put. Host to more marine life than any other aquarium in North America, this not-for-profit aquarium in Atlanta holds an enormous 10 million gallons of water and houses over 100 exhibits. From arctic giants like Beluga whales to brightly coloured displays of tropical fish, the Georgia Aquarium has an overwhelming variety of sea life to check out. Along with educating visitors about underwater habitats and the animals who call them home, the complex is also a leader in research and conservation. The Ellis Hotel: The only independent boutique hotel left in downtown Atlanta, this 103-year-old building is an incredibly unique stay just two and a half blocks away from the Georgia Aquarium and provides discounted tickets for guests. While the outside has a classic historical look, the inside features a modern design with matching amenities: think complimentary Wi-Fi, flat-screen televisions and iPod docks. BCA Residential – Furnished Apartments: BCA Residential’s furnished apartments in Atlanta are a great option for families who prefer the comfort of home when on holiday. Choose your location from a multitude of modern apartments across Buckhead and Midtown. Online check-in and free off-street parking makes for a smooth arrival with kids, so your holiday can begin as soon as you drop your bags. Covering an impressive 70,000 square metres of land, Czech Republic’s star tourist attraction is 570 metres in length and features architecture from as far back as Roman times. Don’t let the name fool you, the UNESCO World Heritage Site is more of a labyrinthine complex than a mere building, with several churches, cobbled lanes and landscaped gardens in its midst. Mandarin Oriental Prague: Prague Castle may be gargantuan, but it used to be even larger. Mandarin Oriental Prague is housed in a 14th-century monastery that was once attached to the sprawling palatial structure. Although the luxury hotel has since been separated from the castle, the must-see attraction is only a 10-minute walk away. What’s more, guests who opt for the Mandarin’s Presidential Suite can take in sublime views of the castle from a private terrace. The historic experience continues in their spa facility located in a converted Renaissance chapel. The Emblem Hotel: The Emblem goes above and beyond the usual expectations of a hotel. 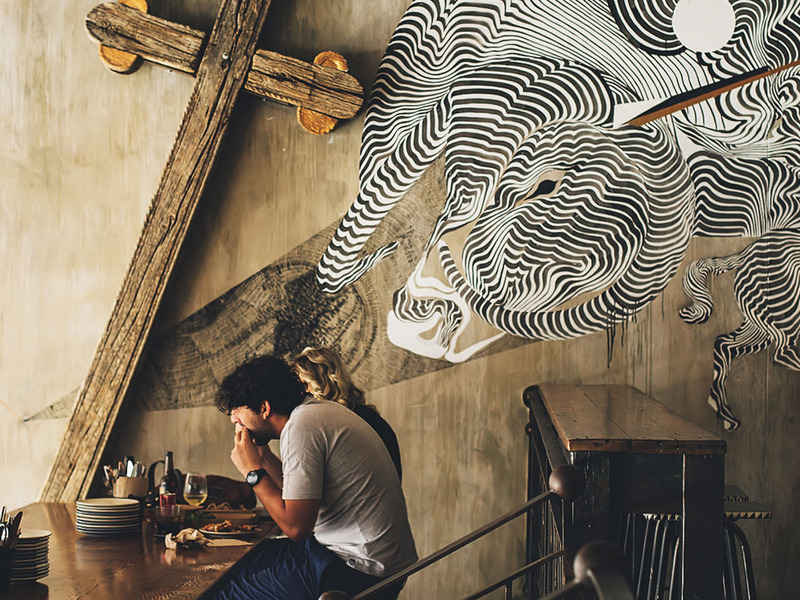 An Art Deco establishment with its heritage well intact, it provides guided art walks around Prague curated by locals, as well as an app with a city guide for those who prefer to discover the city’s delights solo. After a long day strolling cobblestone streets, there’s no better place to relax than the hotel spa, rooftop terrace or fine-dining restaurant and bar.